Notes GM Restoration Parts. 6,000 rpm redline. 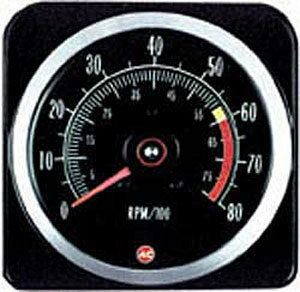 6 x 8 tachometer originally came equipped on Z28 models from January to October in 1969 and models with 396 cu. in. engines with 375 hp. Fast shipping. Cheapest around hands down. EASY TO NAVIGATE THE PAGE, FAST SHIPPING, OVERALL WONDERFULL TO DEAL WITH!!!! WILL SHOP THERE AGAIN!!!! THANK YOU!!! Item was shipped fast and exactly what I ordered. Great price as well. Had great price on carburator and shipped quickly. Only whished they had sent shipping information sooner.